The Virus Bulletin comparative test from last Friday was the first to include our latest version 6.0 and compare it to other security solutions. AVAST submitted as always our avast! Free Antivirus version against other companies' paid-for security suites and even business solutions, to endorse our vision that when it comes to malware, free security can and should be delivering the same protection as paid-for alternatives. All together there were 69 products in the test which – I have to say – is a bit of surprise to me because one keeps thinking there can’t be that many. If woken in the middle of the night I would be able to name 5 brands. Right now I could summon 14 names. Of course there is a little bit of inflation with some brands testing more products (like Kaspersky for example). And then there are a number of products that use the scanning engine or multiple-engines of other vendors. 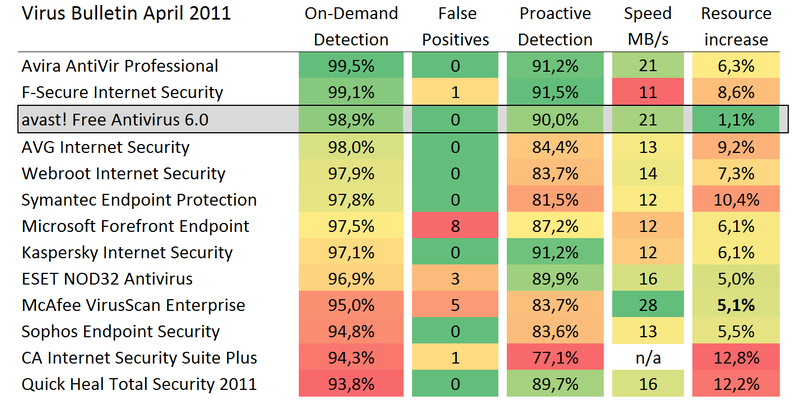 Several multi-engine products scored as always very high on detection (G-Data, Trustport, and others) but of course using more than one engine has an impact on the scan speed and use of computer resources. So how did avast! compare to the others? Excellent indeed! Proactive detection measures detection of new viruses using an outdated signature database. The on-demand test doesn’t take into consideration behavior detection,blocking of infected sites and so on. In speed, avast! was the second fastest performer with over 21 MB/s throughput behind McAfee VirusScan for Enterprise. However, while the avast! scanner increased the usage of computer resources by only 1% (the best score in the whole test) the speed of McAfee came at the price of higher resource usage. Overall then, avast! had the best combination of detection, speed and impact on system resources. Congratulations therefore to the avast! Virus Lab, the Development team, and last but not least to all avast! users participating in the CommunityIQ system for their help in detecting new malware.